TothPix: I Will Not Fail! This wonderful and desperate Toth panel speaks to me right now for some reason. Anyone else? This frame is from the Soldier's Grave story I featured in the previous TothPix post. Analysis of the whole story here. I was lucky to find scans online of a few pages of the black and white original art from Toth's Soldier's Grave. written by Bob Kanigher. It's a stirring little war period piece, featuring old Mullah, who leaves his family to become a soldier, his only chance to earn enough to provide for his family. And because he has trouble keeping up, he is given an opportunity to fight. ...then alters his size and placement within the panels to lead the reader's eye through the page, as displayed below. Next week, I'll post in color and break down the entire story, but until then will leave you with this larger version of the black and white art, cleaning it up and sharpening as much as I could. More thoughts on Toth, other work, and this story at Bob H.'s Four Realities blog, where he's written about Toth more than once. Enjoy! "About original comic book/strip/black and white line art - young or old at examining/enjoy sleuthing-out which lines/dots/jiggles/splats/blobs/streaks/smears/nicks/scrapes/ were accidents - and which were intentional bits of genius-business, done so casually, tho, creating such unique effects, touches - of course we read all kinds of significance into every jot and tittle to express deep worshipful "in-tune-ship" with our pet artist-heroes' art - wrongfully, too, mostly - we fans, of all ages and experience and exposure, are guilty of that sin!" Well, as I've been challenged recently on that very point in regards to Toth's work, and having to plead guilty per Alex's charge, I hope I'll be forgiven if I still indulge in that very pursuit at this blog. I just can't help it. Toth's work just "does it" for me more than any other and I'll continue to pour over his jots, lines and dots. That said, I'll try to be as discerning as possible, and have a post or two planned to poke at some of Toth's weaknesses (far be it from me, but there you go). In the meantime, let's Sleuth-Out! I never mustered the courage or had the guts to write Alex Toth to critique my work, or even a gushy fan letter. I did , however, send him an S.A.S.E. to request a small bit of art from him for a project, which led to the only piece of Toth art I possess. In the mid-'90s my pal and Trollords partner Scott Beaderstadt and I decided to release a (as it turns out, ill-fated) Trollords Classics collection. 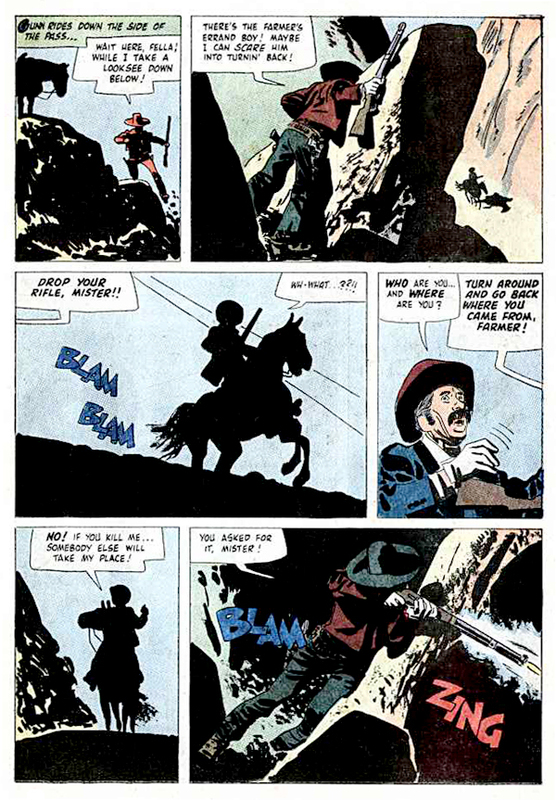 It featured the first three issues of Trollords (originally published in 1986, as well as as a new story called Death Dreams, which focused on the Trollords arch nemesis, Death. In the 30-page story, we got to see things for Death's point of view, and in a large double-page spread his visage from a variety of perspectives. To convey this, we asked as many artist as we could think of and contact to contribute a 2" x 2" piece of art with their depiction of "death." We were pleased to receive back pieces from Scott McCloud, Michael Golden, Alex Ross, Steve Rude, Adam Hughes, Dave Sim, Neil Gaiman, Kyle Baker, Berke Breathed, Terry Gilliam and Will Eisner, among many superb artists. But nothing made my heart skip as when I pulled out the simple piece sent by Alex Toth. Some folks depicted their characters, or a skull, conceptual or spiritual takes on the theme. But nobody offered a more pure expression of the idea. Seeing it for the first time, as bleak as is the outlook, I had to smile. How perfectly Toth. Perhaps he was an atheist, or maybe he knew we all really don't know what is in store for us "after." But this simple black square is one of my most prized possessions. Maybe he was being profound, or perhaps he was just being...lazy.